Coolgardie Cycle Express Service operated in the gold fields area of Coolgardie/Western Australia between 1894 and1896. Paper from Dr. Maurice Alan Mishkel published on the website "Australian Postal History & Social Philately". 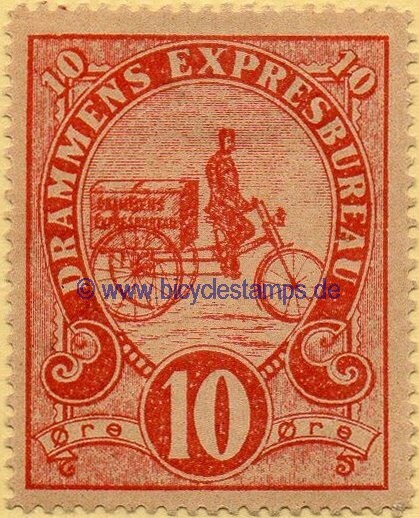 Drammens Expresbureau operated in Drammen/Norway from 1890-1891. Article written in 2000 Jean-Pierre Mangin, President of the EAP at that time. 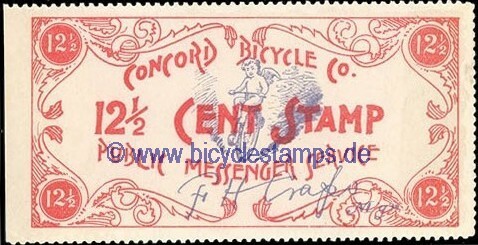 Compare "Le Cycle et la Poste", page 78. 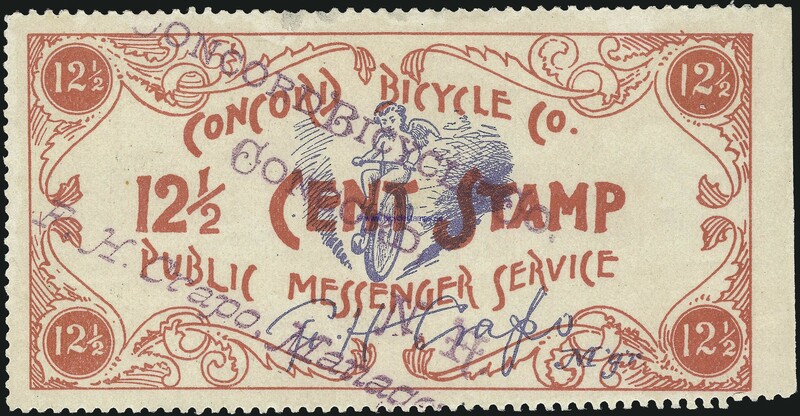 Farrell Collection: Bicycle Mail Route made available by Carriers and Locals Society (Pennypost) as reference for collectors and dealers. 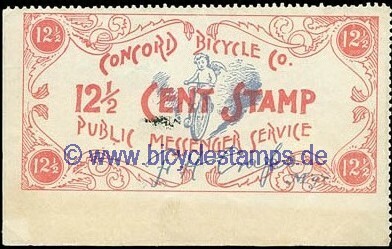 Mysterious Bicycle Stamp Indian labels for boxes of bicycle pedals??? Who knows? Postes Moulins operated in Timaru/New Zealand from 1968 to 1969. Article from Peter Valdner. 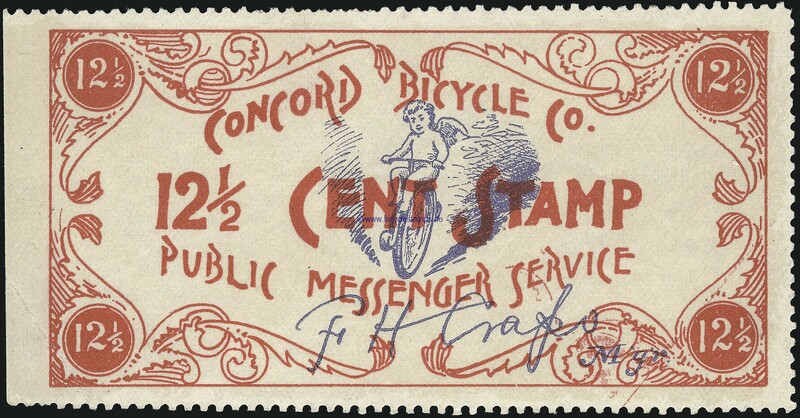 The Concord Bicycle Stamp Article from Gordon Stimmell published in THE PENNY POST Vol. 4, No. 2 in April 1994 (Excerpt with the friendly permission of the Carriers and Locals Society.) 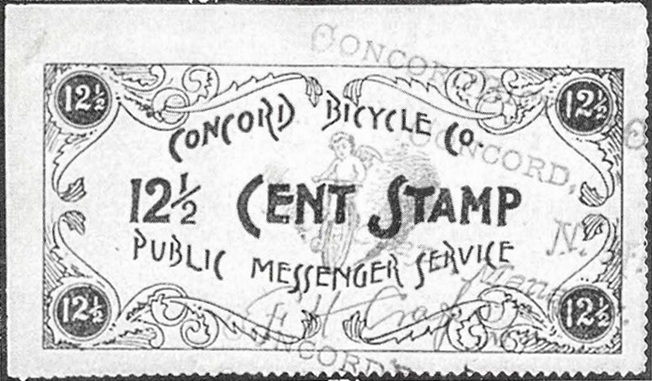 --- This company operated a Public Messenger Service in Concord New Hampshire in the years 1895 to … 1887(?) – managed by F. H. Crapo. Big size, deplorable condition and rough crayon(?) 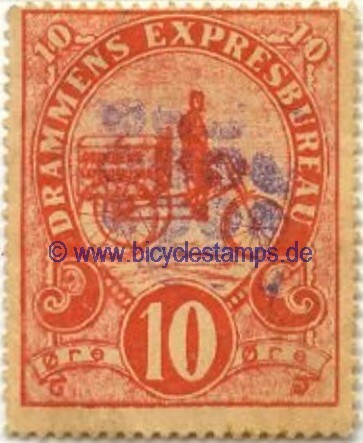 cancellation indicate that these stamps were probably used for the transport of parcels. 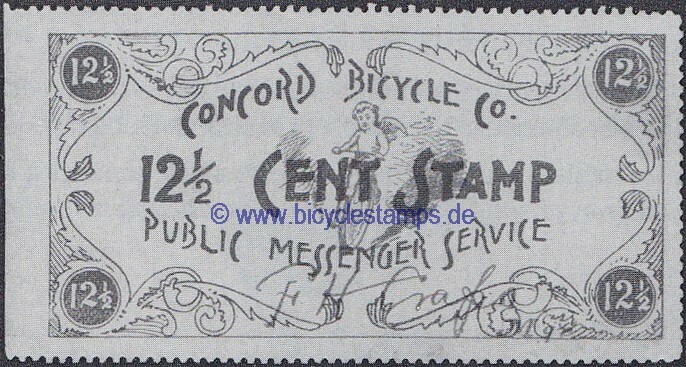 This assumption is supported by the fact, that no covers with these stamps were ever found. 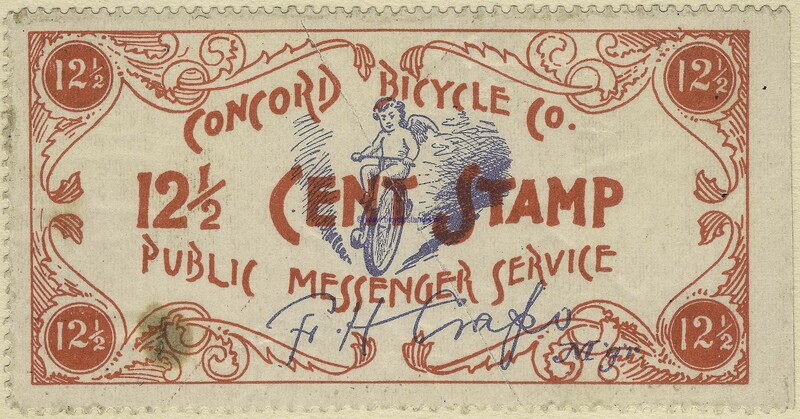 Farrell Collection: Concord Bicycle Co. made available by Carriers and Locals Society (Pennypost) as reference for collectors and dealers. Cycle and Motorcycle Manufacturers - Great Britain perfins (English) by Roy Gault, published by “The Perfin Society” in the December 2009 society bulletin. 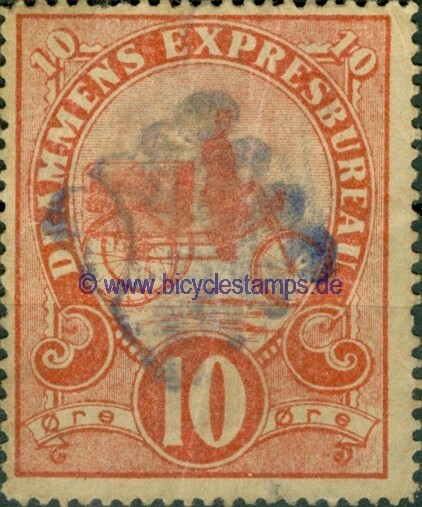 La Taxe sur les Vélocipèdes - French tax on bicycles during the years 1892–1958 (french) by Daniel Spano président de la SFPF (Société française de philatélie fiscale), published in the delcampe magazin no. 21 (May/June 2018), pages 42 - 51. 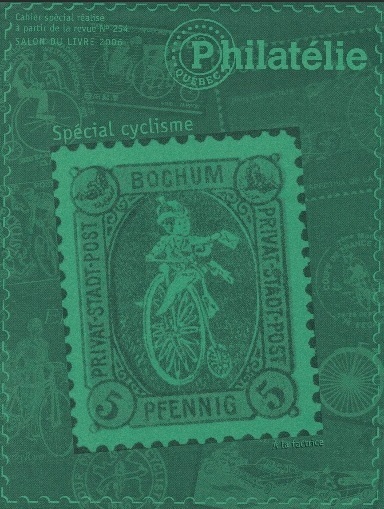 Le Tour de France en philatélie - published in the delcampe magazin no. 14 (July/August 2017), pages 22 - 27. Les entiers de la poste pneumatique de Paris – 1ère partie - French postal stationeries delivered by pneumatic tube system in Paris during the years 1879-1901 (french) by Hervé Barbelin, published in the delcampe magazin no. 21 (May/June 2018), pages 14 - 24. 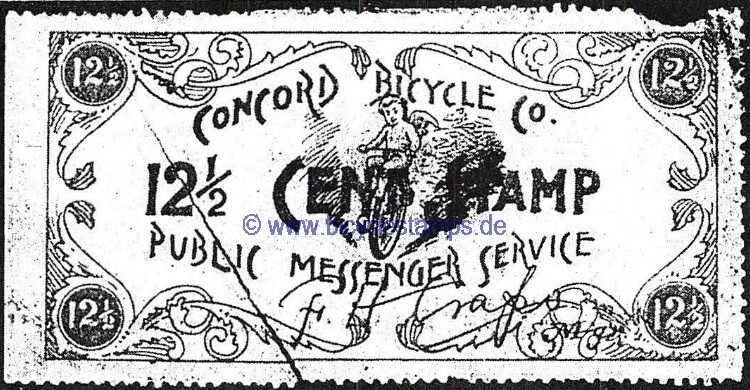 In 1902 the service was extended to the suburbs of Paris – where cyclists delivered the mail outside the pneumatic tube system. Les entiers de la poste pneumatique de Paris – 2ème partie - French postal stationeries delivered by pneumatic tube system in Paris during the years 1880-1896 (french) by Hervé Barbelin, published in the delcampe magazin no. 22 (July/August 2018), pages 32 - 42. 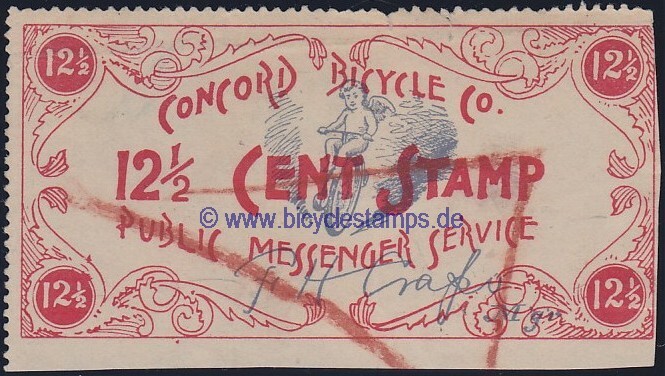 In 1902 the service was extended to the suburbs of Paris – where cyclists delivered the mail outside the pneumatic tube system. 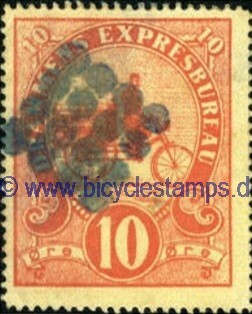 Spécial vélos sur timbres - (french) by Régent Roy, published by Philatélie Québec (FQP) in 2008 on the occasion of '6e Salon Vélo Expodium' in Montréal/Canada). A complete book with 68 pages. 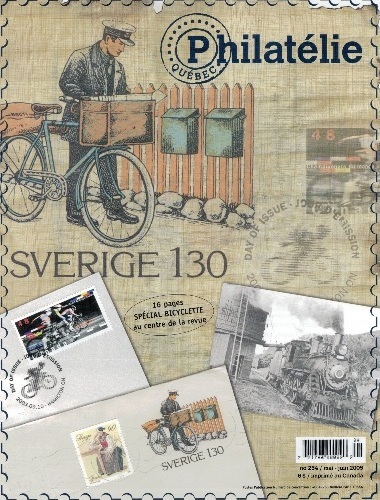 In 19 chapters topics such as history, sports, toys, tandems, Canadian stamps, traffic safety, postal service, professional use, personalized stamps, philately, Théodore Champion, ... are dealt with. Great compliment! MFN - Motor Filatelisten Nederland (NL) The Dutch Motorcycle Philatelists Club was founded in 1987 and has about 90 members (2017). The little difference to the theme of this website is, that their bicycles have an auxiliary drive. 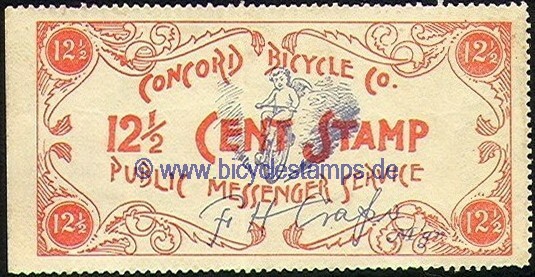 Many articles in their quarterly newspaper are also relevant for collectors of “big bike”. 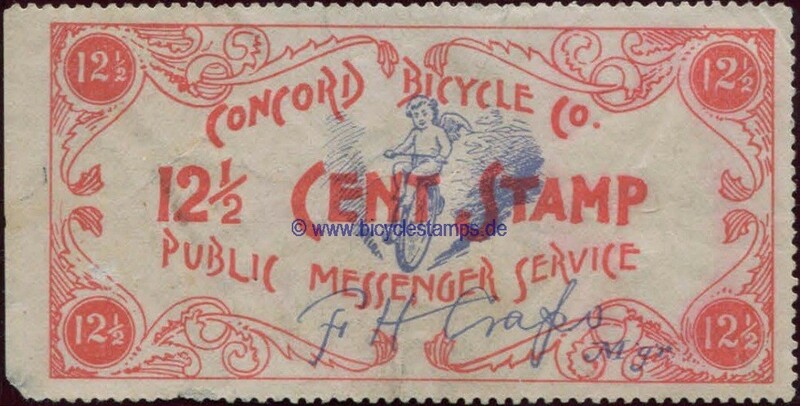 Bicycle Stamps Club The Bicycle Stamps Club was founded in 1986 and has 43 members (2018). 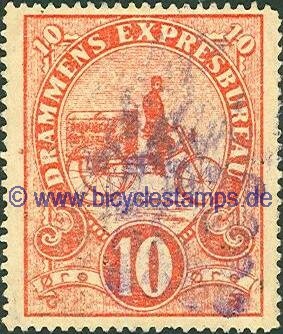 The fietslatelist Jan van Tellingen from the Netherlands: Cyclist and bicycle stamps collector from the early 1980's until 2016. Designed several Dutch personalized stamps. 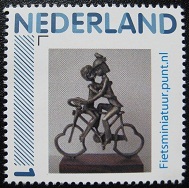 Fiets-miniatuuren Jan van Tellingen from the Netherlands: collector of bicycle miniatures, post cards, posters or reproductions thereof and bicycle stamps - from the early 1980's until 2016. One of the best websites. You can spend hours scrolling down this site. The Fietsfilatelist Piet Hein Hilarides from the Netherlands - author of various bicycle stamps catalogs and active bicycle tourist. CYCLING AS A SPORT René Geslin, co-author of the book "Le Cycle et la Poste", participated in many exhibitions. The exhibit "Cycling as Sport" was sold for 5500 € at the auction house Christoph Gärtner/Germany in February 2017. WORLDS OF PEDALS Vojtech Jankovič - Attention!!! 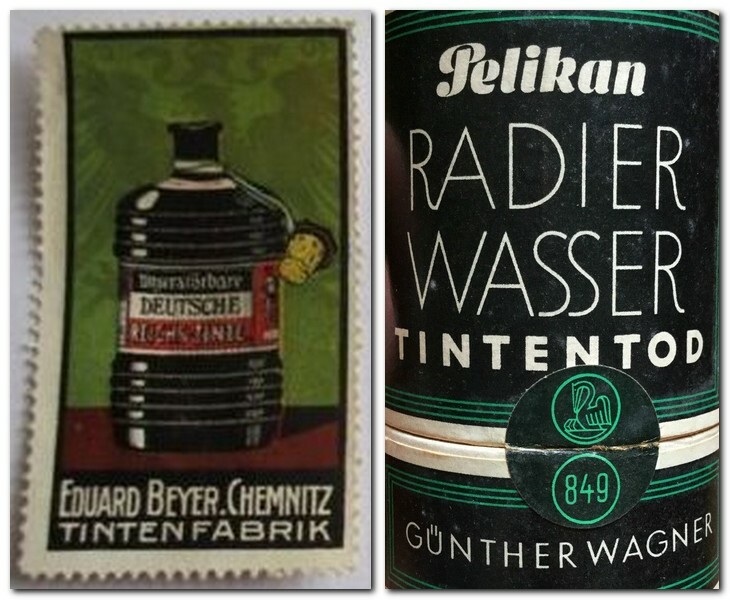 page 41 bottom: do not drink "Radierwasser" unhealthy!! Switch to "Radlerwasser" - the better choice. 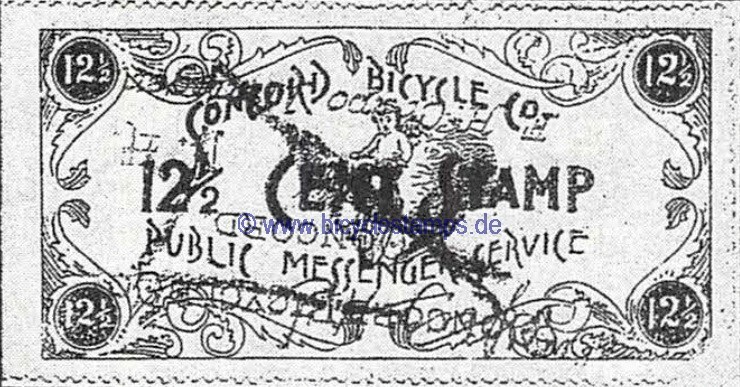 With the bicycle to the front - Field post of German cyclist troops 1939-1945 (WW II) (DE) Hans-Werner Salzmann (Mit dem Fahrrad an die Front - Feldpost der Radfahrertruppen 1939-1945). Highly awarded (multiple gold to R I) exhibition collection. 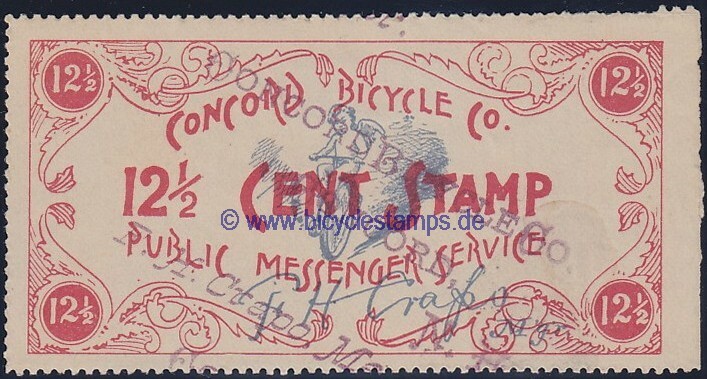 Content: implementation of the bicycle troops, structure and participants, letters with unit information and field post numbers of the Wehrmacht. Sold by auction house Christoph Gärtner/Germany in February 2018 for 4200 €. STORY OF THE NON-POLLUTING TWO WHEELER Inge Johansen (size of pdf-file: 64 MB). Sold by Christoph Gärtner/Germany in February 2019 for 3300 € (without chapter 4.1 Army in War). El Ciclismo: la Epica del Deporte Cycling: The Epic of Sport - Jordi Quintana (Spanish); large pdf-file. Did Singer Bicycles (see page 6) ever produce sewing machines ? 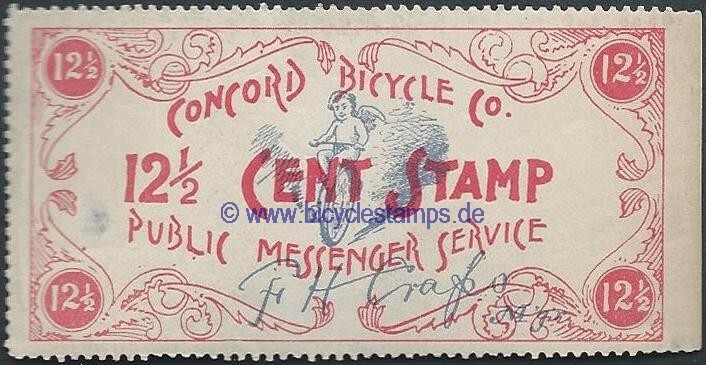 Bicycle Stamps Club on facebook. This group of approximately 55 members was initiated by Raymond See in 2011. 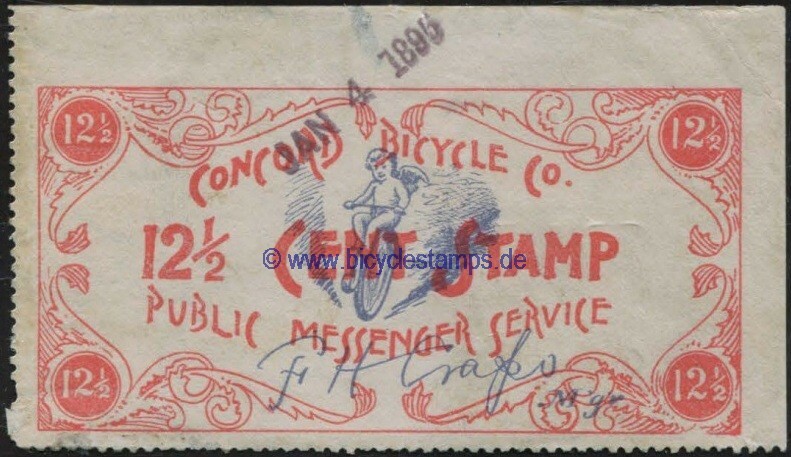 The aim was to attract younger people to the topic of bicycle stamps collecting and to document the work done by members of the Bicycle Stamp Club for future generations. 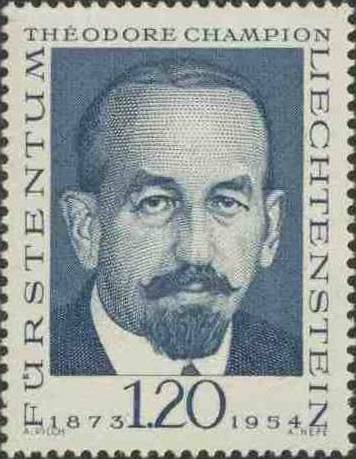 IGPC Inter-Governmental Philatelic Corporation offers Government Services such as market research, stamp design, stamp production, advertising and promotion, sales. Start.Be - postzegels Please check categorie "Thema's"